Independently Tested for the Ultimate Peace of Mind. Our products are regularly tested by AZUMA Design and Testing, one of the only NATA approved test labs in the country. SecureView Eclipx and Xceed security screens continually surpass a range of rigorous knife sheer tests, impact tests, jemmy tests and pull tests. These tests ensure the intrinsic strength and structural integrity of our manufactured security doors and windows. The Jemmy Test involves wedging a lever between the security door lock and hinge and the door frame to which the security screen is mounted. A mechanical winch is used in an attempt to pry the door open. In order to pass the Jemmy Test, the security door must remain securely closed. SecureView Eclipx and Xceed security screens doors and windows passed this AS test with ease. When testing type 3 products, such as SecureView Eclipx, a pull test can only be carried out if a sufficient gap is achieved following the Jemmy Test. If no gap is formed, there is nowhere to mount the Pull Test bracket, or hold onto in a real scenario. Because SecureView Eclipx and Xceed products performed so well in each preceding test, the Pull Test could not be carried out and SecureView Eclipx and Xceed security doors and windows automatically passed. As its name suggests, the Knife Shear Test is designed to test the strength of the security mesh. The Knife Shear Test involves applying mechanical force with a heavy duty knife to the security mesh being tested. This is carried out three times with a new blade for each. In order to pass the Knife Shear Test, the mesh must not allow the blade to make an incision greater than 150mm. SecureView Eclipx and Xceed security doors and windows passed this test with ease. 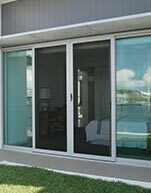 Bush Fire Protection—Secureview Eclipx stainless steel doors have been tested under this standard and satisfied the requirements for bushfire attack level (BAL) 12.5,19,29,40. Fire Attenuation Test—SecureView Eclipx security screens have been tested in general accordance with this standard when exposed to incident radiant heat. SecureView Eclipx achieves 46.6% reduction in radiant heat flux between the inside and outside of the product. © Copyright 2019 Mr Mesh It Pty Ltd.